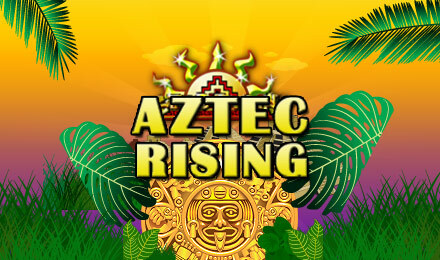 Aztec Rising Slots | 100% Welcome Bonus + 30 FREE Spins! Go on an exotic jungle adventure with Aztec Rising slots! Land 5 Coin Scatters anywhere on the reels and collect 100 FREE Spins & Massive Wins! Good luck! Win your big fortune when you go deep into the Aztec jungle! Aztec Rising slots has 5 reels and 25 paylines packed with symbols such as golden temples, coins, masks, and more! The Calendar Scatter symbol can activate a Prize Pick Bonus where you can pick to reveal exciting prizes! If you can land 3 or more Coin Scatters anywhere on the reels you’ll get up to 100 Free Spins! Be on the lookout for the Wild symbol which is the Golden Temple- not only can it replace other symbols but will payout double!